On 22-11-2016 I presented a presentation with the title “Manage Office365 quick, painless and safe with PowerShell” at Experts Live 2016. During this presentation I showed several useful PowerShell cmdlets for Office365 and mainly for the Azure Active Directory, Exchange Online, SharePoint Online and Office365 Groups. The cmdlets presented can be downloaded as a .zip file using the below download button including the script to retrieve information from Office365 and the presentation in Dutch. A couple of cmdlets are also added below from the .ps1 file. 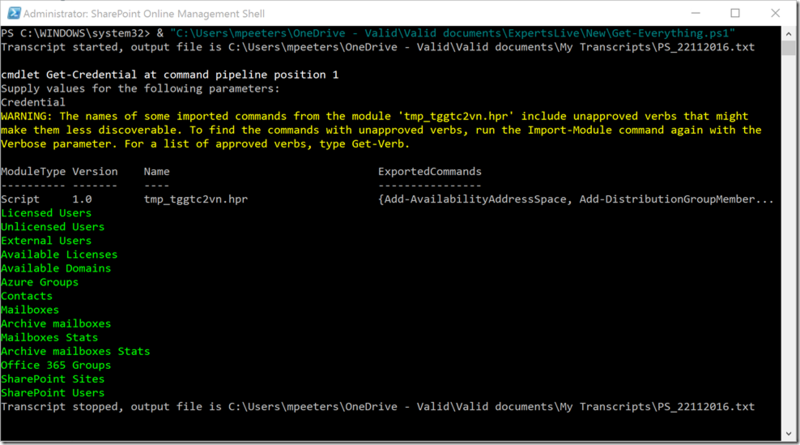 The next cmdlet can be used to get all external users currently in the Office365 tenant. It is also possible to add direct permissions an a users calendar. Keep in mind that this is using the language the user has configured. The default storage for OneDrive for Business Online is 1TB but this value can be increased or decreased using PowerShell. It depends on the users license if they can use for example 5TB or more. Office365 groups can currently only be managed using PowerShell but this will soon change. Use the following cmdlets to check if the mailbox or the document library has been used in the previous 7 days. Set-CASMailbox –Identity LiveDemo.stark -OWAMailboxPolicy "LiveDemoDenyGroupCreation"
During the presentation I also showed a script where I got a lot of information from Office365 and put this information in an Excel file. This script is also located in the download and change the transcript and output location before using the script. The above cmdlets are just a few which are present in the .ps1 file used during the presentation. Please let me know in a comment if these files were helpful and how you used some cmdlets.